There’s No Accounting for Love – A Tale of Rationality versus Romance! The Antique Love, a contemporary tale, is a deeply romantic read, which affirms the power of love which can bowl over even the most rational of us! It is Helena Fairfax’s second novel and focuses on the relationship between an English woman Penny and a Wyoming man Kurt. Kurt, a top flight accountant, has purchased a house overlooking Richmond Park and now seeks a wife to share it with. 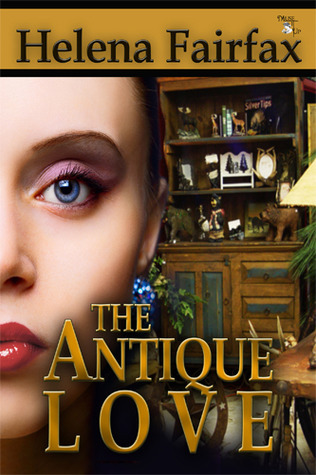 Kurt enters Penny’s antique shop one day and is struck by her affinity and passion for antiques. He offers her the job of refurnishing his new home, a strictly business arrangement – Kurt even tells his sister back home that Penny is not marriage material! Kurt begins to date women he has meticulously selected from an exclusive dating agency as he is keen to find a polished and professional wife who shares his values and outlook. He has seen those in his life badly let down and destroyed by romantic love and grand passion and wants no part of either, believing that they lead to heartbreak. Penny is attracted to Kurt, initially mistaking him for a cowboy due to his demeanour and rugged good looks, which causes her some embarrassment! She finds herself reluctantly agreeing to his proposition to refurbish his home when he offers to look over problems she is having reconciling her accounts. Kurt tells Penny of his decision to find a wife based on logic and calculation and Penny realises that she is the last person that would fit the bill, being more of a romantic, passionate and intuitive type. Penny knows that she must guard her heart lest it gets broken, especially when Kurt makes it clear that he regards her as little more than a kid sister. However, as the weeks pass and Kurt and Penny meet to discuss her accounts and the furnishing of his new home, things do not go according to plan for either party! The more Kurt gets to know Penny, the more he cannot stop thinking about her, even when he dates other women. He realises that he is wildly attracted to Penny whilst acknowledging that she is far from the type of woman he seeks to marry. Penny finds it impossible not to fall for Kurt. Once she has finished refurnishing Kurt’s home will they part as friends, cool decision making and rationality having prevailed, or will Kurt open his heart and realise that Penny is the one for him? Similarly will Penny drop her cool façade around Kurt, which she has assumed to protect her heart, to let Kurt realise how much he means to her? The Antique Love is a very romantic read, with well defined and realistic main and secondary characters. Both Kurt and Penny have been shaped by traumatic past events and they need to confront their feelings before they can resolve their relationship. I loved Kurt as although he is clearly a man used to being in charge he is at the same time considerate and honourable, supporting Penny when she is having a difficult time. Penny is a heroine who you immediately root for and will her to get her man. She is hardworking, enthusiastic and kind and prone to wild romantic imaginings, which Kurt is drawn to despite himself! Unfortunately she also has low self-esteem, due to her life experiences. Penny and Kurt make a couple, who have the capacity to make each other whole again, despite their past hurts; it just takes them a while to see it! I also loved the imagery Helena Fairfax uses in this novel to help illustrate the emotions of the characters and progress the plot, from the antiques that Penny enthuses about to the colours and furnishings she selects for Kurt’s home. If you enjoy a sweet and traditional contemporary romance, with well drawn characters, which is also a deeply romantic and a satisfying read look no further than The Antique Love. A copy of this novel was given to me by the author for the purpose of an honest and fair review. 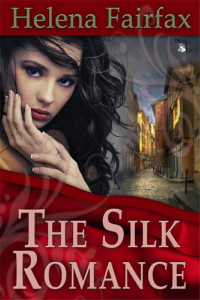 If you like the sound of The Antique Love, you may want to find out about Helena’s other romance, The Silk Romance (click the tiltle for our review). Alternatively click on the links to find out more about Helena and her work and to go to the publisher’s site where you can purchase her novels. This entry was posted in Contemporary, REVIEWS (ALL) - Reverse Chronological Order, Romance and tagged American-hero, antiques, contemporary, London, strong-hero, sweet-romance.